Barnsley head coach Daniel Stendel is confident Kieffer Moore will be fit for Tuesday's trip to League One promotion rivals Luton, not that they have missed him too much. The striker, who has netted 13 goals this season, has been absent for the last two games through illness. But Stendel said: "We have an important game on Tuesday so we didn't want to risk Kieffer. We need Kieffer in the next games." 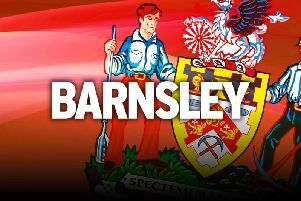 Barnsley have not suffered any disappointment in Moore's absence, strengthening their promotion bid with back-to-back victories. A 2-0 win over Peterborough on Boxing Day was followed by a 2-1 triumph over Charlton as the Reds moved up to fourth in the table. They are six points behind second-placed Luton, who they visit on New Year's Day, with a game in hand, after seeing off the sixth-placed Addicks at Oakwell. Brad Potts and Mamadou Thiam fired Barnsley into an early 2-0 lead and, despite a Ben Reeves goal in the second half for the visitors, they held on for a third consecutive win. Stendel said: "I'm very happy. It was a good performance against a good team. "It was very close at the end but we deserved to win. I'm happy for the club, the supporters and my team that we won this game. "I have a lot of trust in my team. When we need to fight, we can fight. "It's hard sometimes but all the teams are in the same situation and it's good that we can end this year winning games. It gives the players a lot of confidence." Potts broke the deadlock in the fifth minute, smashing a first-time shot past Jed Steer to finish a fine move which also included Cauley Woodrow and Thiam. Thiam then received the ball around 25 yards out and advanced before arrowing a shot into the top left-hand corner of Steer's net. "Both goals were very good. We told 'Pottsy' and Mamadou that we needed them to be more ruthless in front of goal in this game and I'm very happy that both scored," Stendel added.